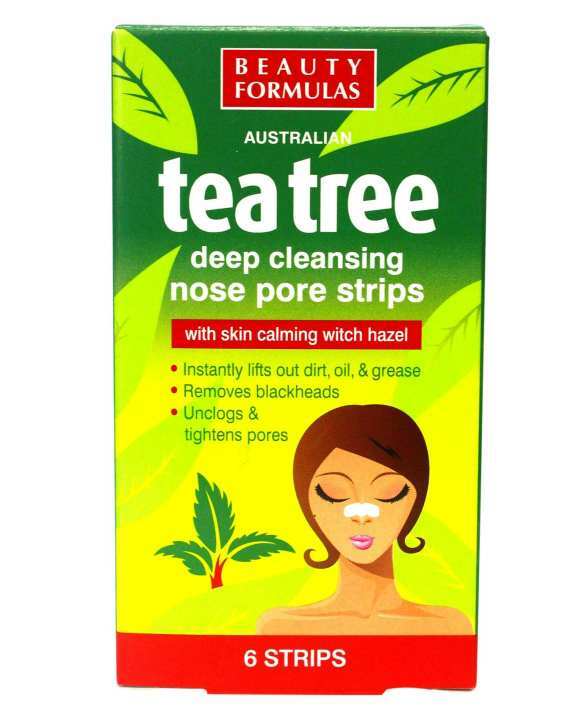 Beauty Formulas Tea Tree Oil originates from Australia. It is a natural antibacterial agent believed to have a number of beneficial effects and antiseptic properties. Our deep cleansing nose pore strips with Tea Tree are a simple instant cleansing treatment designed to unclog pores and clear unwanted blackheads. The strip adheres to the skin to remove dirt and oil which clog pores to quickly improve the look of your skin. Pores will be cleaner and less visible. Continued use will work to tighten and refines the pores. With skin calming witch Hazel extract to keep skin cleaner, fresher and healthier. Wash face/moisten nose-wash your face thoroughly with soap, making sure that it’s free of any cream, lotions or makeup. Thoroughly wet your nose. The strip won’t stick on dry nose. Dry hands and peel the strip off the plastic liner. Apply strips to moistened nose area with the smooth side down, pressing down to ensure good contact with skin. Let dry for 10-15 minutes. The strip should feel stiff as it dries. After the strip has dried, slowly and carefully peel off the strip starting at edges and pulling towards the centre.